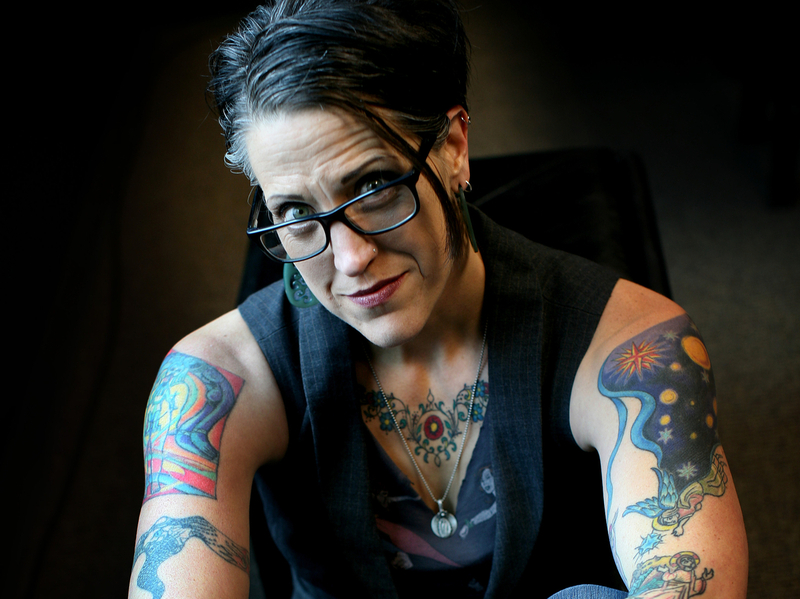 Lutheran Minister Preaches A Gospel Of Love To Junkies, Drag Queens And Outsiders Nadia Bolz-Weber was a standup comic who opened up a church for people who didn't belong. "My job is to ... remind people that they're absolutely loved," she says. 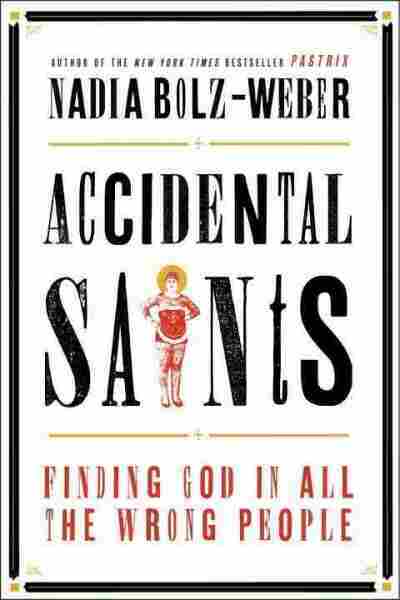 Her new memoir is Accidental Saints. Lutheran Pastor Nadia Bolz-Weber says that all are welcome at her Denver church, The House for All Sinners and Saints. Bolz-Weber tells Fresh Air's Terry Gross that while addressing the crowd of "academics and queers and comics and recovering alcoholics" at the funeral, she realized: "These people don't have a pastor, and maybe that's what I'm supposed to do." Still, Bolz-Weber admits to feeling uneasy when "bankers in Dockers" started coming to her services: "It threw me into a crisis, because I felt like, 'Wait, you could go to any mainline Protestant church in this city and see a room full of people who look just like you. Why are you coming and messing up our weird?' "
My job is to point to Christ and to preach the Gospel and to remind people that they're absolutely loved ... and all of their mess-ups are not more powerful than God's mercy. Ultimately, Bolz-Weber says, mixing more traditional newcomers with her church's original parishioners has been good for her congregation. "I thought it was diluting the weird; now it's much weirder to have them all together," she explains. And regardless of who fills the seats, Bolz-Weber's message from the pulpit remains the same: "My job is to point to Christ and to preach the Gospel and to remind people that they're absolutely loved ... and all of their mess-ups are not more powerful than God's mercy and God's ability to sort of redeem us and to bring good out of bad." Other than the fact that I tend to swear like a truck driver? ... I don't look like a pastor, I'm very heavily tattooed, I have sleeve tattoos, basically, and very short hair, and I'm, like, 6-feet-1-inch [tall]. I don't actually act like a pastor either. I don't have that sweet, nurturing, "come to me; I'll co-sign on all of your BS problems," like, I just don't have that warm, cozy personality, and I'm kind of cranky and a little bit sarcastic, I guess. Nobody ever meets me and guesses. The best thing is on airplanes. ... Eventually if you talk to [people], which I try not to do, but if it has to happen, then they'll say, "What do you do?" and I'll invite them to guess, and never once have they guessed. I did get "burlesque dancer" once, which pleased me to no end. If you're a middle-aged Lutheran pastor and someone guesses you're a burlesque dancer, that feels like a win for the day. I had to start a church I'd want to show up to, basically. I really love Lutheran theology and I love the ancient liturgy, but I'd look around Lutheran churches, and no one looked like me. ... I would have to culturally commute to show up to those churches, and I wasn't really eager to do that, so I basically became a pastor to my people. My call to ministry was very particular: It was to do this thing, to start a congregation, because I went to my bishop at the time and I was like, "Man, you could, like, put me in some church in the suburbs or in the country, but you and I both know that would be ugly for everyone involved, so let's just say I start one." He goes, "Yeah, that sounds better." If you're a middle-aged Lutheran pastor and someone guesses you're a burlesque dancer, that feels like a win for the day. I think a lot of congregations have a situation where there are more people talking about God in the basement during the week; the basement of their church is more full of people talking honestly about their lives and connecting that with some kind of trust in God. I think that happens more frequently in their basements than it does in their sanctuaries. ... You know what organization is not really having a problem is AA; it's doing fine. They're not in a crisis. There aren't meetings in AA where they're like, "How can we get people to start showing up more?" So I think that there's something about people speaking honestly about their lives, and sometimes, I think, church is more about pretending your life is fine, and, I think, less and less people have time for that. That's what is challenging to me about Christianity is that exact thing — being forced to look at your own stuff and being pushed into a space of grace that's really, really uncomfortable. We have people who are atheist, agnostic, people who are very evangelical in their faith; somehow it's a space where people who believe a lot of different things can come together, but that doesn't mean I'm like a crypto-Unitarian. So I'm not just quoting Thich Nhat Hanh in my sermon; I mean, I'm actually a very orthodox Lutheran theologian, and it's a very sort of Christo-centric community, but it's one in which really everyone is welcome to come and participate. I don't monitor people's behavior, let's put it that way. So much of Christianity has become about monitoring behavior, and so far it has just failed to work as a strategy for making people better. For instance, we're in the middle of this Ashley Madison scandal with all of these clergy, so on some level Christianity became about monitoring people's behavior, like a sin-management program, and that almost always fails and often backfires. I would actually argue that conservative Christianity's obsession with controlling sexuality — I mean absolute obsession with it — has in fact created more unhealthy sexual behavior than it has ever prevented. I really believe that. When I heard about this kid, and I heard about all of these wonderful things about him, and how queer he was, and how he played piano, all this stuff about him — he struggled with just a tiny bit of heroin and mental health problems. When I heard about him, I thought, "That is exactly the kind of guy Jesus would hang out with." We see the cast of characters Jesus surrounded himself with, people for whom life was hard, and who had some colorful things going on, and rank fishermen, and prostitutes, and tax collectors, and these are the kind of people Jesus chose to surround himself with, and I think that's important. I have no idea how Christianity went from that to what it is now.